Higham is a charitable trust, run as a not for profit social enterprise, and any surplus goes back into improving what we have. We are always upgrading and re-furbishing something. Our current focus is to make genuine improvements that will make a difference for everybody. This includes an effort to meet the expectations of all those who are likely to benefit from Higham in the future, making the premises as user-friendly as possible. All, of course, without ruining what was already have. This page outlines what our more ambitious plans are, to give an idea of what we are aiming for. Whilst we seek to fund as much as possible ourselves, we are actively seeking opportunities for donations to help. These are all projects conceived with those who use Higham in mind – who we wish to keep coming for as long as possible. These will also enable us to remain a significant provider of residential courses in the 21st century, with more chance of meeting the needs of those who can come to enjoy the pleasure of true lifelong learning. If you feel able to make a donation towards any of these, please contact the Principal. Even small amounts can help, from meeting the cost of a light bulb upwards. Our income comes from the courses we offer – we have made the decision not to chase the commercial market so that we preserve the integrity of offering courses to students. Keeping Higham a vibrant, pleasant place to be for adults of all ages is our priority. We are currently working on an area in the grounds next to the pond to create a pleasant gathering area from which artists may observe the Pond in all its beauty. Not quite Giverny, our aim however is to develop the view so that it can be a scene to draw and paint, and even just to savour. The work has been helped, in part, by private donations and some on-going Raffles of Tutor’s artwork. What it says on the tin. The idea will involve also moving the Studio entrance down the building to the end so that we can create an internal ramp to get people easily up to the classroom at the other end (which is up a step) and also eliminate the current step needed to get into the Studio. Doing this means losing the current Gents loo, but then we can create a new entrance through so those pesky 7 steps up to the Bar, Cedar Room, Harness Room and Studio can be avoided. Converting the Bungalow from 3 standard rooms sharing 1 bathroom to 4 ensuite bedrooms to provide practical ground floor accommodation. Whilst we are limited in the Hall itself as to what can be done (7 bedrooms are still non-ensuite and all are upstairs), we can improve things. We will transform the Bungalow to suit what is needed to meet modern expectations and realistic needs for those who come, taking some of the pressure off the Main Hall. The Bungalow was built in the 1960s for the then warden of the girl’s school. It was not conceived as accommodation for the college, and as such, in its current form is very limited in its ability to meet people’s needs. The most urgent of these being more WCs! However, we feel that we can do better than simply adding a convenience WC and so are trying to reconfigure the layout and create a new, accessible bedroom. We will still have the Gatehouse with its own kitchen and lounge as am occasional holiday let – but the current form of the Bungalow, despite recent upgrades in the past three years, does not suit what the college’s needs are. Using heritage colours and cues to refurbish bedrooms and public areas so that they reflect significant eras the building has been through. We are being fussy about what we are using and making sure things are done to a high standard, both for longevity and for aesthetic appeal. 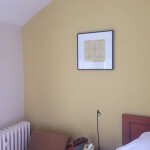 For instance, Bedroom 2 has been repainted in heritage colours with a feature wall the same base colour as a heritage wallpaper sample from the 1870s, which we have framed as a reference point. 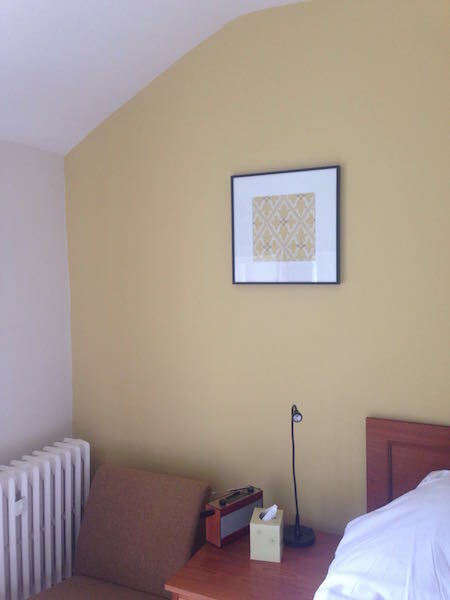 The heritage wallpaper is being used in some larger bedrooms. 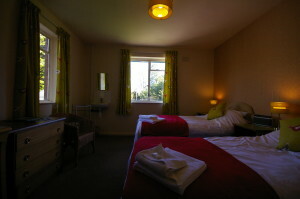 On a practical note, in some rooms we are installing larger mirrors, better curtain poles and, eventually, new carpets and soft furnishings to upgrade the feel. In addition, the correct contrasts are being sought for door frames and windows to accommodate visual impairment and create good tonal distinction so that thresholds can be easily identified. A shelter in the garden which will look out on the wonderful view we have here. Alston, a residential college much like Higham, was closed in December 2015 after many years serving Lancashire and its Friends group wished to use up some remaining funds to help something within the spirit of what they supported. 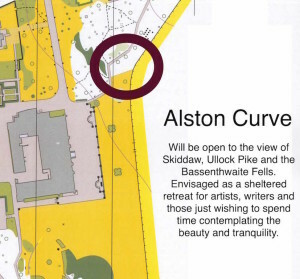 Friends of Alston have therefore kindly agreed to fund a special ‘gazebo’ in the grounds. This will have a prominent position to the left of our front lawn and has been chosen as a quality product with a good lifespan, maintenance-free, suitable for the Lakeland climate and, more importantly, will be of genuine service to the users of Higham. Artists especially will use the shelter for outdoor work, but it will also be a sheltered haven for anyone wishing to spend some time contemplating the most wonderful views we have. Sleek and simple, the structure is “one continuous curve, arching gracefully from the ground, a seemingly gravity-defying contemporary garden shelter.” It will be fastened securely to a base for all weather use. Open at the back and also at the front, from where it will command a tremendous landscape view, sheltered from the elements. There is a clever use of clear styled polycarbonate to cover the panels, allowing light in but keeping the area underneath dry, integrated within the innovative design combining both functionality and aesthetics and the wood is treated to provide a 25 year guarantee against wood boring insects and all types of rot. Dimensions: 5.3m wide x 3.1m deep x 2.2m high. Make no mistake, this is a luxury item befitting Higham that will be noticed and appreciated for many years to come. Once upon a time, there was a tree house in the grounds and the Alston Curve will be a spiritual successor to that and the enjoyment that it once represented. 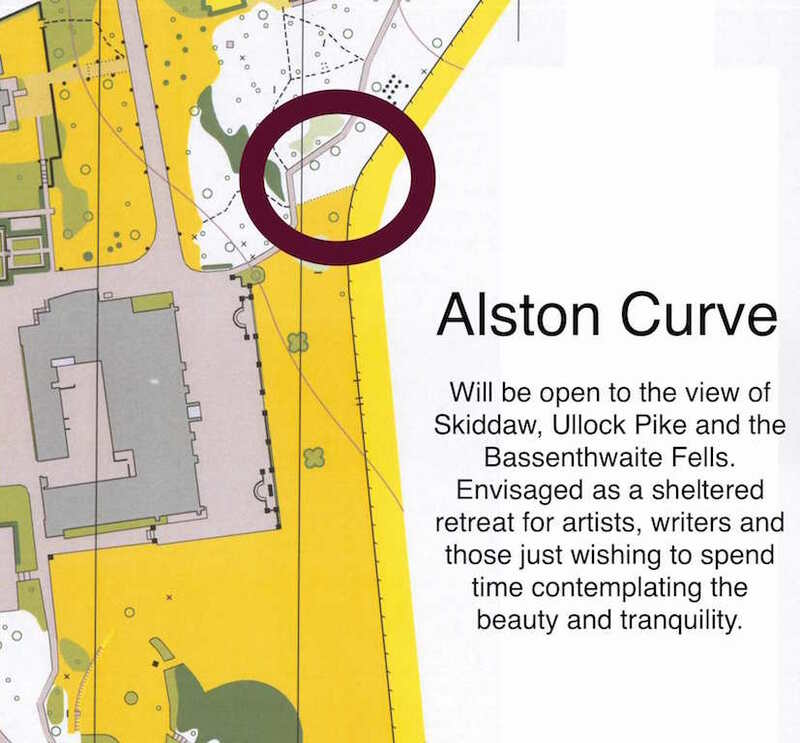 Thank you very much for thinking of Higham and we hope Alston’s Friends will return to see their Curve int he years to come. Places to sit and rest are essential for everybody. They can make the difference between people making the most of our wonderful grounds and wasting the opportunity. Often people need the chance to have a rest anyway, splitting their journey to a further location. Whatever we choose, and we try a variety of things to sit on, a decent quality wooden item which we know has been safety-tested and has a good chance of lasting outside is essential. How things look is also important, as we do not wish to ruin the feel of the grounds. The practical purpose must always be served properly. Individual donations have funded various new mahogany wooden benches around the grounds. These provide places to sit and rest and to enjoy the gardens and the views. The Friends of Higham have made a donation towards new accessible wooden tables with seats in the Courtyard. These are good quality, with seat backs and space for wheelchairs. Most importantly, one does not need to haul one’s legs over to sit on them, simply slide in from the side, keeping both feet on the ground. Our Gardening Team work tirelessly in the grounds to keep them safe and beautiful. The grounds are a major resource for Higham, giving those who come space to be inspired, to learn from and to enjoy. The Psychological benefits are immense, but we also recognise the historical legacy of the Georgian/Victorian Garden and a moral need to tend and nurture what we have. Some individual donations have funded special trees of specially chosen varieties to enhance the spaces we have outside.